WSU nursing, medicine, pharmacy, and nutrition and exercise physiology students, plus WSU alumni, volunteer at Camp Stix in July 2018. Photos by Sarah Schaub. CUSICK, Washington – Cougs roam Camp Stix, an annual summer camp for kids who have Type 1 diabetes. Nearly two dozen students from Washington State University Health Sciences Spokane’s nursing, medicine, pharmacy, and nutrition and exercise physiology programs are volunteering at the week-long camp this year. That doesn’t include the many WSU alumni who became acquainted with the camp as students and now take a week away from homes and careers to serve there, or the WSU faculty who help run the camp. For some WSU students, it’s a clinical experience that’s part of their studies. For a few, it’s intensely personal – they have Type 1 diabetes (formerly called juvenile diabetes) and once were campers themselves. Most call the camp inspiring, and say they’ll be better health care professionals because of it. That’s one of the benefits of having students volunteer at the camp, said Laura Wintersteen-Arleth, a senior instructor at the College of Nursing who’s been involved with Camp Stix and its predecessor, Camp Fun in the Sun, for more than 20 years. Another is the chance to work on teams that could include doctors, nurses, pharmacists, nurse practitioners, physician assistants, and nutritionists. Erik “Ergo” Stiles has volunteered at Camp Stix for 10 years, beginning as a nursing student at WSU. Stiles just completed his first year at the WSU Elson S. Floyd College of Medicine, and this year he brought eight of his fellow med students to camp with him. The group began meeting in January to prepare for the diabetes care they’d be giving the campers, who range from 9 to 18 years old. Stiles said he wants to help expand the number of WSU Health Sciences students who participate to ensure Camp Stix’s continued growth. The camp accommodates about 200 young people during its one-week session, but there are about 900 kids who have Type 1 diabetes in Eastern Washington, North Idaho and Western Montana, he said. The camp was founded in 2000, with a day camp for younger kids called Camp Twigs starting in 2016. It’s currently held at the Riverview Bible Camp on the Pend Oreille River, about 60 miles north of Spokane. About 200 volunteers work there, with health sciences students helping to provide diabetes education and 24-7 medical care to campers. 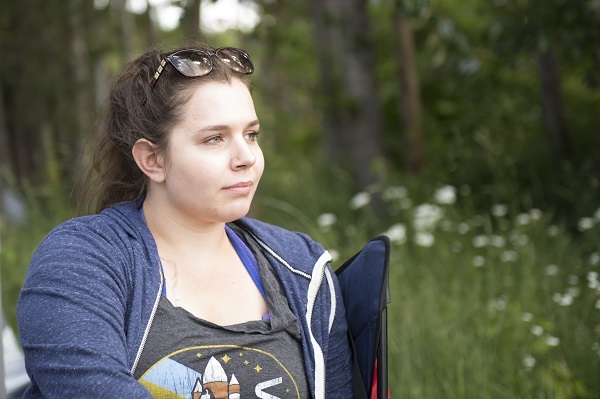 Nursing student Leah “Limbo” Emert is very familiar with Camp Stix – she was a camper from ages 9 through 16, then became a junior counselor and a counselor there. Now she’s a student in the WSU College of Nursing who’ll graduate in December and is writing her Honors College thesis on Camp Stix. Leah “Limbo” Emert attended Camp Stix, then worked as a counselor there, and now is a nursing student volunteer. That means bumping fists with a 10-year-old girl who caught sight of Emert’s insulin pump and exclaimed, “You have the same kind as me!” It also means making rounds during the night to check campers’ blood sugar as they sleep. Jeremy “Jambon” Jackson wasn’t diagnosed with Type 1 diabetes until he was 15, so he only attended camp for one year. His friends who had the chance to spend multiple summers at camp were better at self-care, he said. Jackson is entering the master’s program in Nutrition and Exercise Physiology in August and wants to work with patients who have diabetes. At camp he’s the director of specialty diets. 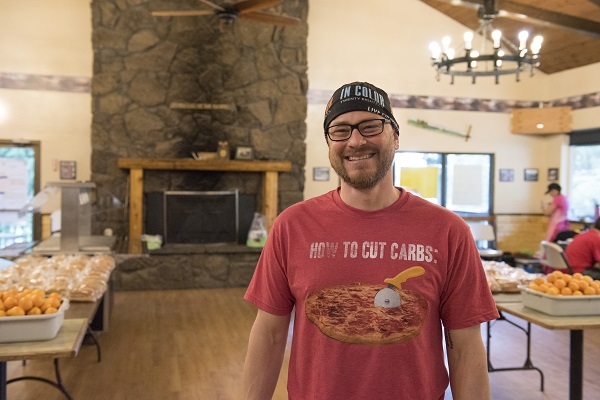 Jeremy “Jambon” Jackson, who’s entering the master’s program in the Nutrition and Exercise Physiology Department at WSU, is director of specialty diets at Camp Stix. Alyson “Antibody” Blum, clinical assistant professor of pharmacotherapy at the WSU College of Pharmacy, is in her first year as co-medical director at Camp Stix. She described the growing number of WSU health sciences students volunteering there, noting this is the first year the camp has partnered with both the Elson S. Floyd College of Medicine and the Nutrition and Exercise Physiology department. “This camp has an ongoing, great relationship with WSU,” she said. About Camp Stix: The camp is held for a week in July, and there’s a related day camp for younger kids, Camp Twigs, held at Dart-Lo Day Camp. Both are run by Camp Stix Diabetes Programs, a 501(c)3 nonprofit. The camp is funded by camper tuition, and public and private donations. For information or to donate, visit www.campstix.org.